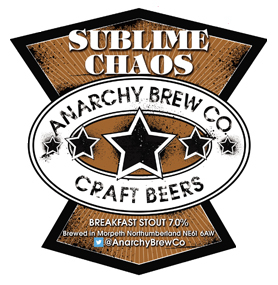 Sublime Chaos Breakfast Stout, from Anarchy Brew Co, is reviewed by Ruari O’Toole. It’s always a good sign when a beer pours like black petrol and carries the word “breakfast” on its label. Sublime Chaos pours thickly from the neck of its little 330ml bottle and the head soon withers away to a thin line of chocolaty foam topping the body of this tart, blacker-than-murder beer. The first mouthful slides across the palate with notes of dark chocolate and coffee that are as subtle as the name suggests, while the coffee taste is still strong enough to underline the breakfast theme the brewers have gone for with this beer. The aftertaste brings a luxurious heat, a warmth that hangs around resolutely between gulps, and a taste and feel of brittle, cracked dark chocolate pushes through the warm fog of coffee tones. There’s a delicious crispness on the tongue, a snap of flavour and dryness that’s hard for me to write about elegantly; a taste and feel that somehow manages to remind me of the crack and burn of a Christmas cracker’s unsheathed guts. There’s the mildest carbonation, and the glass is left squeaky clean as the beer line drops. All the while the warmth and the sumptuous taste remain in place, the flavour thickening as the glass empties. There’s a feeling of dustiness in the drink, not in the taste but perhaps in the slightly (possibly dangerously!) thirst-inducing nature of this beer. Scenes of dark drawing rooms that haven’t seen a duster since the maid went insane a decade ago pop into the mind’s eye as Sublime Chaos manages to both refresh and slightly dessicate, to give with one hand and with the other take away just enough to leave the drinker wanting more. Breakfast stout it may be but for me this is a beer for the darkest of nights, a drink to pour among conspirators, usurpers and traitors. A drink for the point in the night not marked on the clocks. For late night klatsches that end in a resounding decision to assassinate the Prussian ambassador, this is the beer. Pushing aside the garbled scenes from non-existent Victorian dramas this beer conjures up for me, Sublime Chaos is a wonderfully balanced piece of brewer’s art that keeps the chaos of its 7% abv tempered alongside the rich flavour all the way up to the sharp and crisp, wonderfully high pitched taste of the final mouthful. As I write this, three tiny spots of thin foam are the only sign on the glass that the drink I just finished ever existed. Sublime Chaos leaves barely a breath of evidence on the sides of the glass to prove it was there, although with its sturdy alcoholic content and teasingly sessionable nature it could easily ride a wave of poorly written text messages and hungover shivers to its place in the previous night’s history.